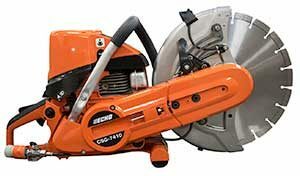 Echo added the CSG-7410 cut-off saw, to be showcased at this year’s GIE+EXPO trade show in Louisville, Ky.
Powered by a 73.5 cc two-stroke commercial grade engine, the CSG-7410’s high cutting torque is attributable to a 2.6:1 drive ratio of the wheel pulley to the drive pulley, allowing it to cut through thick masonry blocks or dense concrete without bogging down in the cut, according to the company. The saw’s four-stage air cleaner system protects the engine for longer life. The CSG-7410 starts easily due to the spring-assist starter, decompression valve, choke with automatic fast idle and purge bulb. The starter system is completely sealed. The saw also has a reversible cutting arm with a standard position for normal cutting and a reversed (outside mount) position to cut close to buildings or ground obstacles. Other features include a stainless steel shield for high strength and corrosion resistance; aluminum handle with rubber grip for comfort and vibration reduction; a translucent fuel tank; a momentary stop switch that automatically returns to the “on” position; and a standard water kit with brass valve and quick release adaptor. The CSG-7410 is available this fall at an $899.99 MSRP with a one-year warranty. It will be demonstrated in Echo’s booth #7451D during the GIE+EXPO, Oct. 18 and 19.